An unusually long contract dispute between Frontier Communications and local CBS affiliate KIRO-TV means customers north of Seattle are unable to watch KIRO's broadcast of the fireworks show and popular programming like "The Big Bang Theory," "Big Brother" or CBS coverage of the PGA Tour. Many will watch fireworks light up the Seattle sky Wednesday night from the comfort of their homes as KIRO 7 broadcasts the show live for the sixth year, but thousands of local residents won’t find it so easy. For six long months, Frontier Communications customers in Snohomish County and elsewhere in KIRO’s viewership area have been unable to watch popular programming like “The Big Bang Theory,” “Big Brother” or CBS coverage of the PGA Tour thanks to an unusually long contract dispute between Frontier and local CBS affiliate KIRO-TV. Subscribers to Frontier’s FiOS TV service, which the company distributes over its fiber-optic network, lost access to CBS in January after an agreement between Frontier and KIRO’s parent company, Cox Media Group, expired on December 31. Attempts to reach a new agreement between the two companies have hit an impasse, with each side accusing the other of being unwilling to negotiate over fees Frontier must pay to include KIRO in its channel lineup. “They just have no justification for the rates they’re trying to extort from us,” said Steve Ward, Frontier’s senior vice president for video technology and content. Ward said the CBS blackout includes approximately 20,000 customers near Everett. Greg Bilte, vice president and general manager of KIRO 7, said Frontier sought a much lower rate than other companies. “We create content, and cable companies go out and take our signal and sell it to their customers, and we charge them for that,” Bilte said. Everett resident Bob Shepherd said his family hasn’t missed channel 7, and the CBS blackout has had little effect on them. “We simply sign up for CBS All Access when there is something worth watching, as we recently did with the Tony awards,” he said. But Frontier customer Mike Garofano said his family’s favorite local station is channel 7, and they are “very unhappy” with the removal of CBS from Frontier’s channel lineup. Edmonds resident Jeff Arbuckle, who’s been a Frontier customer for the past 9 months, said the real issue is the lack of transparency from both companies. “The heavily biased ‘details’ provided in both sides’ statements just don’t help an intelligent person decide who’s right in this,” he said. Arbuckle also questioned why customers are still being asked to pay for programming they aren’t receiving. Ward said no refunds or credits have been offered, but the company is addressing customer complaints on a case-by-case basis. 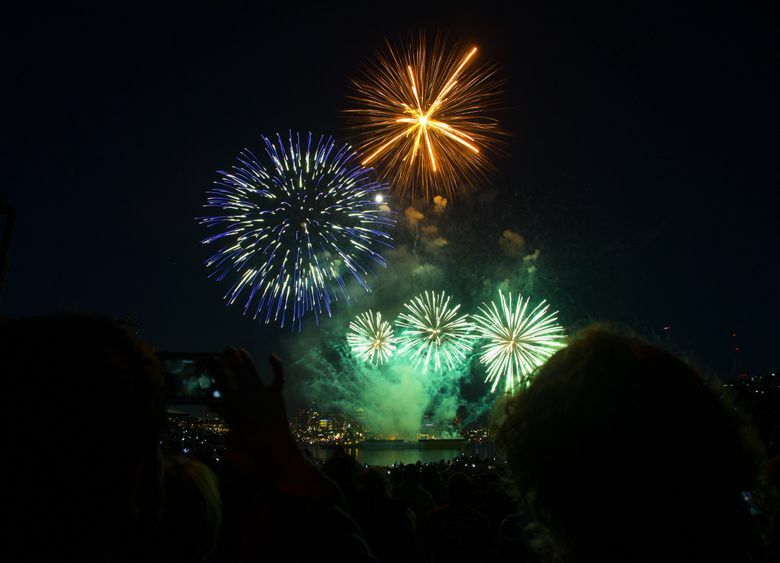 KIRO has broadcast Seattle’s Seafair Summer Fourth fireworks at Lake Union for five years. It says Frontier customers can still watch Wednesday’s fireworks show live online through KIRO’s apps and Facebook page. Frontier, a Fortune 500 company that provides internet, TV and phone service to customers in 29 states, said in January that Cox Media Group was asking for a rate increase of 80 percent over the next three-year contract period. KIRO’s Bilte said his company is asking Frontier to pay the same rates as others are paying. Neither company would discuss specific numbers. KIRO owner Cox Media Group operates broadcast television stations, radio stations and daily newspapers in 20 markets across the country, “reaching approximately 52 million Americans weekly,” according to the company’s website. In an emailed statement, Cox said it has completed agreements with over 100 cable and satellite companies in the past year, and Frontier is the only one it’s been unable to come to terms with. “This is by far the longest service disruption KIRO has ever experienced by a cable operator or satellite provider,” the company said. Contract disputes over “retransmission” fees are common in broadcast media but usually are resolved more quickly, said Atif Zubair, associate research analyst for S&P Global. “This is a small dispute in that it only involves one station, but it’s one of the disputes that’s biggest in terms of the time frame,” Zubair said. Consumers can access local broadcast channels for free with over-the-air antennas, but a provision of the 1992 Cable Act requires cable and satellite companies to get permission to include a broadcast channel in their lineups. Cable companies must negotiate new retransmission fees with station owners every three years. Zubair said a certain percentage of those fees paid to local network affiliates is then passed back to the larger, national networks such as ABC, CBS or Fox. Industry publication Multichannel News reported in 2016 that CBS told investors it plans to reach $2.5 billion in such revenue by 2020, a 25 percent increase over the company’s previous estimates. With broadcast networks and cable companies fighting over rising transmission fees, channel blackouts across the country have increased steadily since 2010, according to a database maintained by the American Television Alliance. Station blackouts more than doubled last year to 213. Ward said Frontier would still like to have KIRO’s programming included in its channel lineup. “If they would reduce their rate, we’ll add it back on,” he said. KIRO is “open and willing to negotiate, ” said Bilte. This story has been updated to clarify that the blackout extends beyond Snohomish County to other areas in KIRO’s broadcast territory served by Frontier.